What’s unique about their approach is that they are making a series of collaborative beers with other local breweries to gain some pre-opening traction in what they are calling the Convergent Worlds Collaboration Series. Beer has been a part of Christian’s fondest memories—travel to far-flung locations with family and friends, toasting his engagement at Ankor Wat, chatting around many a campfire, and so many more. Drinking beer in Europe, Africa, Asia and, of course, America, got him hooked on enjoying quaffable beer served from beautiful glassware in cozy settings. 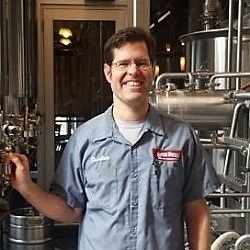 So much so he was compelled to leave his job at an environmental non-profit 10 years ago to become a commercial brewer. Christian is excited to now be realizing his dream of creating a spot like that in his home community. It was a revelation when Brett realized beer wasn’t just a flavorless yellow beverage. He told his friends he’d open his own brewery someday. Ten years later the dream is about the become a reality. Brett has toured Europe drinking beer, quit his job in finance and did a brief stint as an assistant brewer. 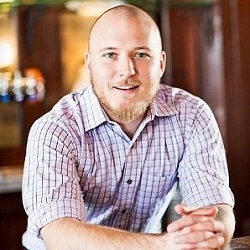 He followed that with managing multiple restaurants and most recently was General Manager of Republic in Takoma Park. This is when two different breweries pair up to make a beer. They come with the recipe, name, and physically brew the beer together and launch the beer in tandem with both their names attached. Christian and Brett started their brainstorming for a brewery promotion around 15 months prior to opening. They were in a good spot to see other breweries in the area opening and how they were promoting themselves. They observed what worked, what didn’t. One promotion that stuck out to them was a cidery making collaborations. Christian and Brett put some feelers out and started formulating what messages they wanted to send with the beers they were going to make—a breweries first beers are always going to show what your brew stands for. They specifically tried to stick to beers their collaborators were good at making instead of going completely off the wall. As of the episode recording, they have brewed four collaborations with and want to do a few more before their opening (projected for November 2018). They have carefully planned to open at what they hope will be a crescendo of excitement about their beer. Here’s the impact it’s had so far: approximately 500 Facebook Likes, approximately 270 Instagram and Twitter Followers, and 400 or so email subscribers.